Excuse me, but isn't this where we started? Then, there were high expectations for the Saints. There were none for the Bucs. Then, Drew Brees was one of the NFL's best quarterbacks. Jameis Winston was suspended. Then, the Bucs shocked the league with an upset victory. Now, they have a chance to do it again. Three months later, and once again, Tampa Bay is a massive underdog against the Saints, and no one can figure out how these defensive backs can cover those cornerbacks. And once again, the Bucs hope to have a puncher's chance as they face New Orleans. Don't be mistaken. It is a bigger game for Tampa Bay than it is for New Orleans, despite the Saints loss to Dallas. If the Bucs lose this one, any chance of a winning season is gone. Probably, any chance at the playoffs is, too. Still, the Bucs have won two in a row, and they're at home, and the defense is playing better, and the Bucs have won the last two meeting between the teams. Hanging with Brees is always a chore. Brees has won 16 of his 26 games agains the Bucs, although he has only three wins in his last seven. Over his career, Brees has a 97.6 quarterback rating. He's thrown for almost 7500 yards and 51 touchdowns. The Bucs hope that an improved pass rush will help them. They have had four sacks in each of their last three games. 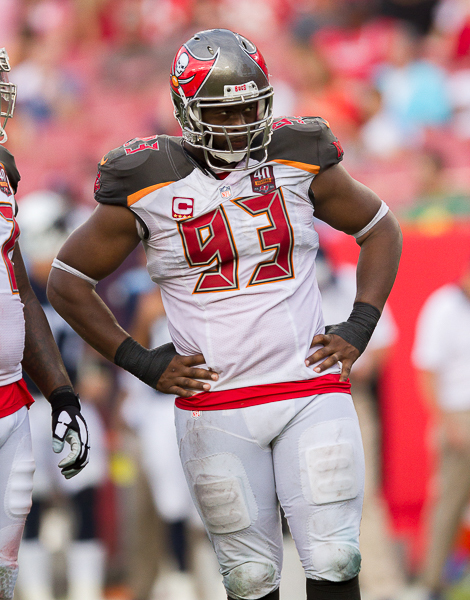 Defensive tackle Gerald McCoy credits the takeaways of the last two weeks. Said Koetter: “I think the defensive staff has done an excellent job of working together. They spend a lot of time in that meeting room. I know even on game day Duff’s (Mark Duffner) calling it from the field, but he’s also going back and forth between the other defensive coaches, getting input. When you say getting input on game day, that window of time that you have to get input is seconds because the next call has to go in. Then you have a little bit more time in between series. I think they’ve done a good job of utilizing players and putting guys in different roles. Then I think they’ve done a good job of collaborating, on getting guys in the right spots and then giving more varied looks. I think they’ve done a really nice job in that area. The Saints are third in the NFL in scoring at 34.9 points per game. The Bucs have given up 29.6 points per game, 30th in the league. The teams play at 1 p.m. at Raymond James Stadium.